Door Size (W x H): 4,86x3,04 m.
Box dimensions: Box 1: 111.0 x 41.0 x 191.0 cm. Box 2: 111.0 x 46.0 x 191.0 cm. Storage shelter for many purposes - Garage for your car, storage for boats, machinery, materials, bikes, garden furniture, wood etc. Gives you extra space in no time - in short, the possibilities are countless. The construction of the tent is made of galvanized steel tubes, treated with a careful surface corrosion treatment. The included stake pegs attach the ground bar frame to the ground to secure the shelter against strong wind. Furthermore the tarpaulin has a dirt skirt on both long sides which protect against cross wind. This dirt skirt must be dug into the soil or covered by heavy stones or other heavy material. The tent can also be mounted on concrete foundation by using expansions bolts, if necessary. The tarpaulin is made of PVC material and build up of a 3-layer construction coated on both sides. The build-in rip stop effect will prevent a possible tear to develop further. The ta rpaulin is UV resistant which gives a long life and good protection of the goods stored in the shelter. Na Mascus.hr možete naći strojeve marke Dancover Storage Shelter 7x14x3,8m Telthal iz kategorije ostali komunalni strojevi. Cijena toga Dancover Storage Shelter 7x14x3,8m Telthal stroja je 15.009 kn, registrovan je bio 2017 godine. Taj stroj se nalazi u - Danska. 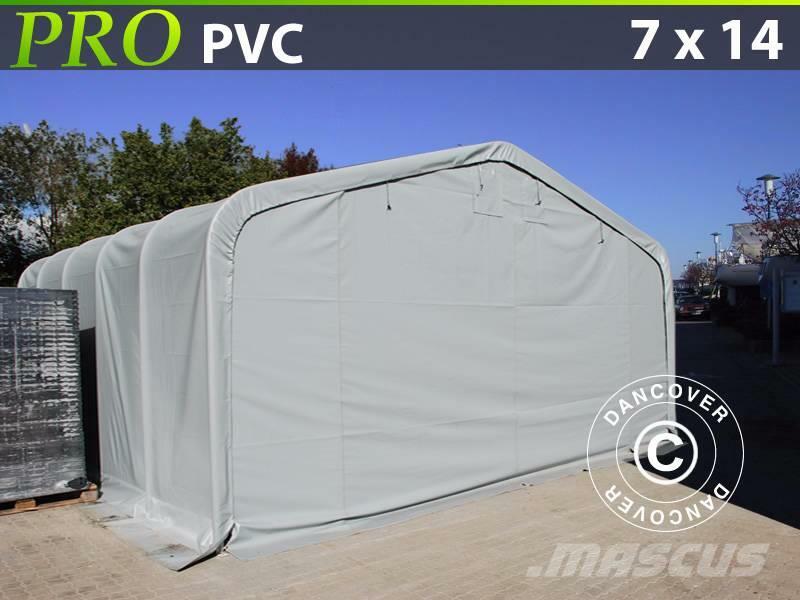 Na Mascus.hr možete naći mnogo drugih strojeva marke Dancover Storage Shelter 7x14x3,8m Telthal takodje kao i druge strojeve iz kategorije ostali komunalni strojevi.